I started this post and few days ago and I must admit I struggled to find things to be happy about. Probably why you shouldn't blog in the midst of tonsillitis. I have made a recovery now and I do indeed have things to be cheerful about. I'm happy that Little A finally got his star of the day on Tuesday! 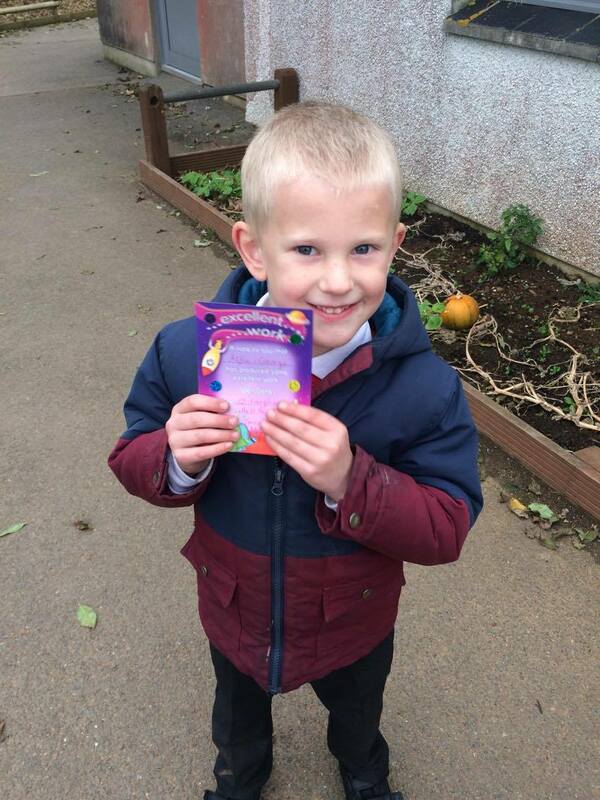 He's waited so long and his teacher said he had an ace day so it was definitely his time. He was over the moon and we were really proud. Midge went for her second gymnastics session on Monday. It was meant to be a taster session but she's already decided it's for her so she went in in a new leotard and got put in for a badge which she got! Well done my Midgey! Oh yes, I have to be cheerful about this one. I finally, finally got a call from school and I can volunteer! They've asked if I can help out with forest school 2 days a week and I jumped at the chance. It'll be more fun than listening to the children read and I love being outside, plus it's year 1 which is perfect for me. They were inundated with offers so I'm happy to get what I was offered and actually I think it'll do me more good being outside than in. I got to see my Aunt this week which was lovely, I just wish it was for a little longer. I had a browse around town then thought I'd surprise my Aunt and Gran by appearing at her house. Unfortunately no one was in! I did get hold of my Aunt and we had a nice chat over some mushrooms on toast. 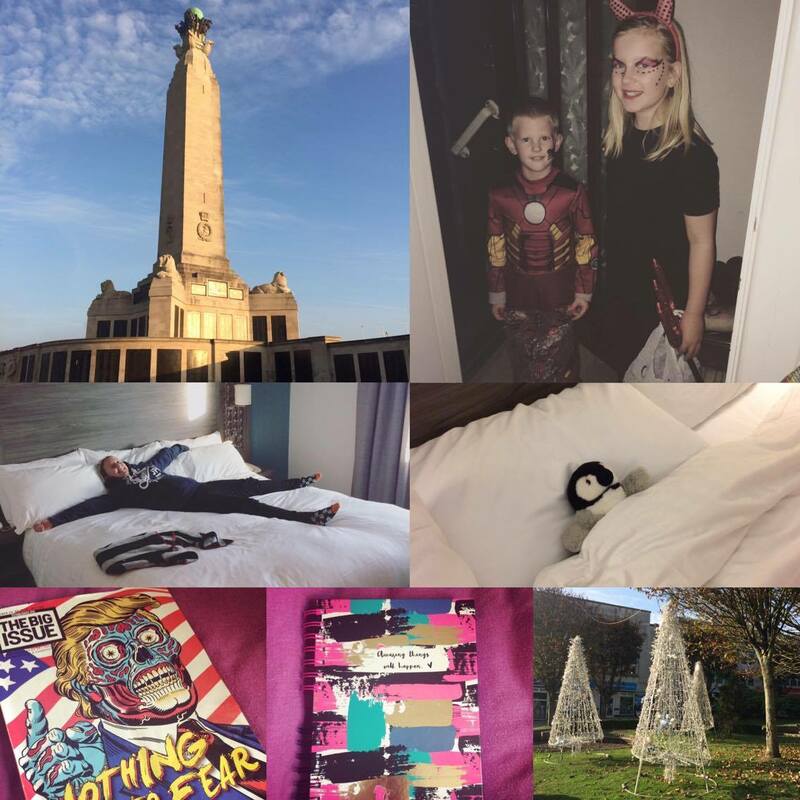 To enjoy our night away at the end of October in a hotel but to not waste any money- We had such a great time together. 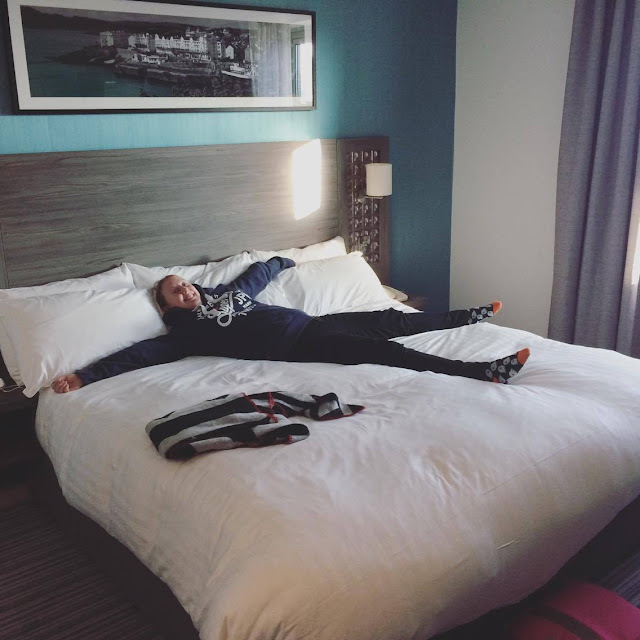 The room was lovely, Plymouth was wonderful to spend time in and we really didn't waste any money at all. Sort out change of address and the energy suppliers- Dull! Very dull but very simple to sort, wish Mr B would change his too though! To have caught up on my snail mail- I believe I have caught up! I have a new pile now though!. To celebrate my birthday- My birthday was spent in Costa, with family, seeing a friend, having some lovely gifts, lots of cards and lovely cake made by mum. I also had a lovely tea cooked for me by Mr B. To sort my finances again- Well they are sorted but looking a bit sad this time of year! To have paid £20 towards Midges London trip and something towards Little A's Plymouth trip- Paid but soon it will be installment time again! Decorate the house for Halloween- We decorated the front room which looked awesome! Go trick or treating, carve pumpkins as a family and have fun- We really did have a fun half term and a pretty frugal one too. We carved a pumpkin (well A and I did) which we called Pumpkin Joey this year, we went trick or treating and also enjoyed dishing some sweets out too. 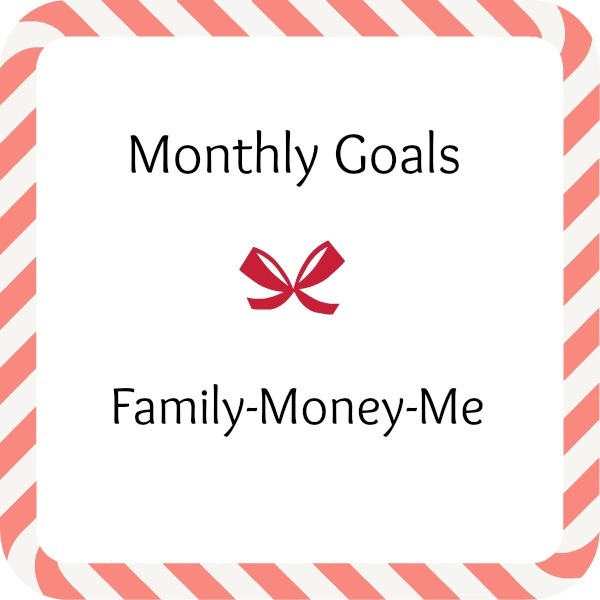 Some good goals for this month and a couple I have already completed as I'm late posting! 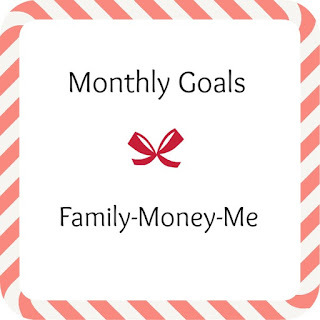 What are you goals for November? We've left October, my favourite month. 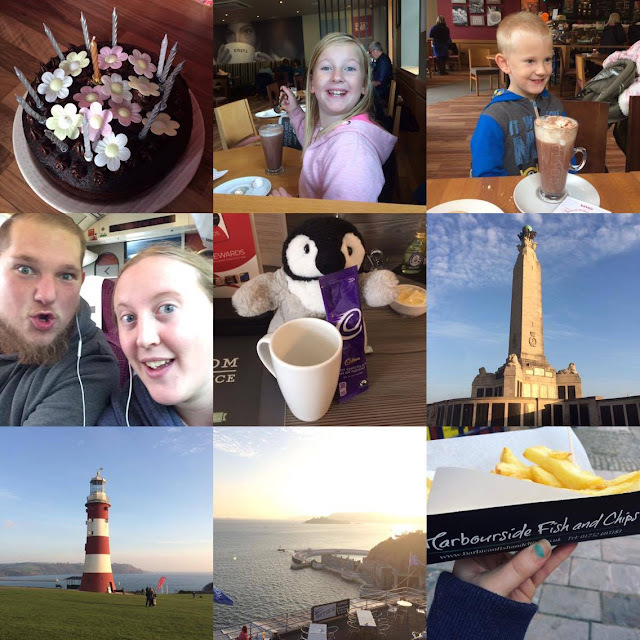 We spent the first week of October moving into our new place which we are now settled into. I've unpacked and moved things about so it all feels much better now. We had BT over to sort the phone and internet which was a success and came at a good time with needing to sort some things out online. My parents bought the children a new bed which they love. We asked for a bunk bed because the room was going to be too cramped with 2 beds in there. Dad found a triple bunk bed which is awesome and we're all really pleased with it! The children have been doing good at school but mostly they've been counting down to Christmas and Halloween! They've both had poorly days with Midge having a bad head and A getting croup which took a bit longer to clear up. We've all had colds (Mr B spread it around!) but have all plodded along. A has been doing really well with his homework and also now goes into school by himself which is a big step for all the children. Half term sort of came around very quickly but before the children got some time off I managed to catch up on my happy mail and sort out lots of house bits plus get their Christmas presents which have been successfully hidden! Over half term we took the opportunity to do free things now we're feeling the pinch a bit more. Don't get me wrong, we're better off than a lot of people but throughout the year we have some good months and some harder months like many and just before Christmas plus a house move draining the small savings I did have hasn't made things any easier. We've had some nice walks together (well nice might be pushing it considering it has been raining!) on the Monday the weather was gorgeous so the washing was put on the clothes horse, the dog was walked and then we headed to the park for the afternoon bumping into several friends which was nice. 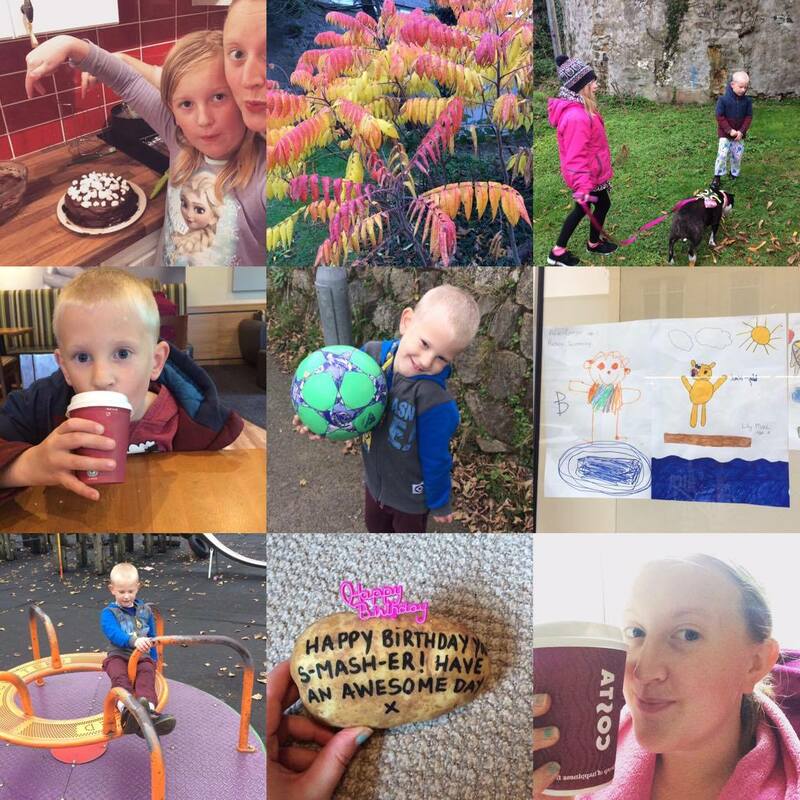 Midge's first cake in the new house//Autumn trees//Half term leafy dog walks//A getting a Costa whilst waiting for Midge to finish her club//Both children have a children up in the local Boots//A in the park//My birthday potato!//Birthday Costa! Little A had his first ever friend for dinner experience! He had 2 friends over (they're twins) one took to Midge and stayed with her and A played with his other friend. There was role play games, Lego, colouring in and some Lego Jarassic Park for me sit through while they talked in a little circle on the front room floor! We've had some film and TV days, Midge and I baked a rather lush chocolate cake and we've seen both Grandma and Pops on different days. There has been lots of Minecraft and You Tube in this house too this half term! I turned 27 last month! I had a great day. My friend visited and treated me to lunch, we went to the park and had a Costa which my Mum also came to. Mum baked me a lovely cake with the help of my little ones. The next day Mr B and I headed to Plymouth for a night where we had a lovely hotel stay, walked around Plymouth, saw the lighthouse and then the memorial which was really emotional to walk around. A chippy tea was exactly what we needed before heading back to enjoy the bath and comfy bed at the hotel. October was a really good month for all of us I think. How was yours? Milkshake! Fabulous Friends DVD Giveaway! I have a little giveaway today for all my readers. Below is a Gleam form which you can use to easily enter my Milkshake! 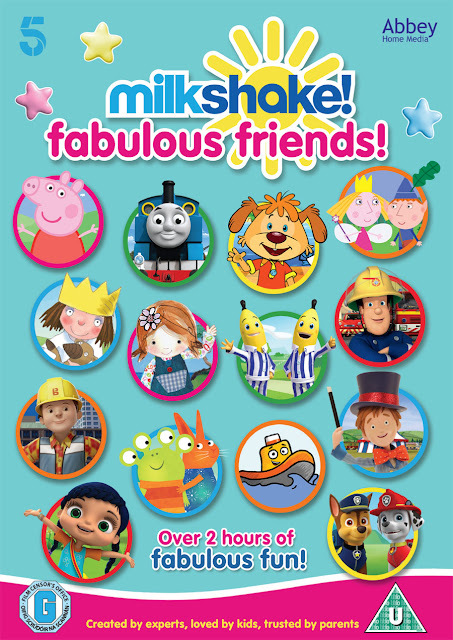 Fabulous Friends DVD which features loads of your childrens' favourite characters and is released Monday 7th November! Peppa Pig – In ‘The New Car’, Peppa's family car breaks down. While it is being mended, they borrow a shiny new one from Grandad Dog's garage. Thomas & Friends – In ‘The Thomas Way’, Harold the Helicopter breaks down, so Thomas and Duck take him to Sodor Search and Rescue for repair. Thomas wants to show them the sights but Duck isn’t keen. They need to learn to work together. Pip Ahoy! – In ‘ Alan Loses His Bounce’, Alan starts the day full of music and bounce, until Norman the Snail tells him that bouncing is silly. Pip and Alba organise a surprise to cheer him up and get his bounce back. Ben & Holly’s Little Kingdom – In ‘Books’, Queen Thistle reads the children a story which inspires a question. They can't find the answer in the magic books in the castle, so go to the Wise Old Elf in the Great Elf Library. Fireman Sam – In ‘Jupiter on the Loose’, the Pontypandy Pioneers visit the fire station, and Norman ends up accidentally driving Jupiter through Pontypandy. Sam races to the rescue! Lily’s Driftwood Bay – In ‘Stop That Pudding’, Lily puts her newly discovered set of measuring spoons to good use when Nonna takes a tumble and needs a rest, leaving Salty to step in and cook an important pudding. Bananas In Pyjamas – In ‘Power Cut’, Morgan accidentally causes mayhem in Cuddlestown when he plugs in too many lights and speakers in preparation for Camembert's birthday party. Little Princess – In ‘I Want My Treehouse’ Little Princess builds a treehouse, then discovers Algie and Maid are also building one in the tree next door! Soon they are in competition to see who can build the best one. Bob the Builder – In ‘Lofty Lets Loose’, Bob and his team are building a new giraffe enclosure at the zoo, but Lofty's excitement about meeting his favourite animal gets the better of him. Wanda and the Alien – In ‘Starfish’, Wanda and friends help a hermit crab to find his starfish friend who was swept out to sea, aided by a giant whale and some important fish. Toot the Tiny Tugboat – In ‘Toot's Funny Side’, Toot arranges a funny No Talent Show to help Paula the Trawler overcome her embarrassment when she makes a mistake. Toby’s Travelling Circus – In ‘Ribbons and Strings’, Toby is inspired to create a ribbon-and-strings act in the show after witnessing the havoc caused by Momo and Freddo earlier with a yo-yo. Wissper – In ‘The Slow Slow Loris’ Sonia the slow loris asks Wissper to help her speed up as the chattering monkeys keep taking all the best fruit first. Wissper decides to enlist the help of Monty the meercat. Paw Patrol – In ‘Pup Pup Boogie’, Ryder, Chase and Rubble use their dance moves to help repair the tracks before the next train arrives. Giveaway ends on 20th November 2016 11:59pm. UK entries only please. 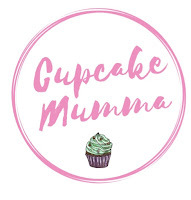 Prize will be sent out to the winner (not by Cupcake Mumma) The winner will need to supply their email address so I can confirm the winner with the pr company. The winner has 28 days to claim their prize before another winner will be chosen. Good luck to you all! 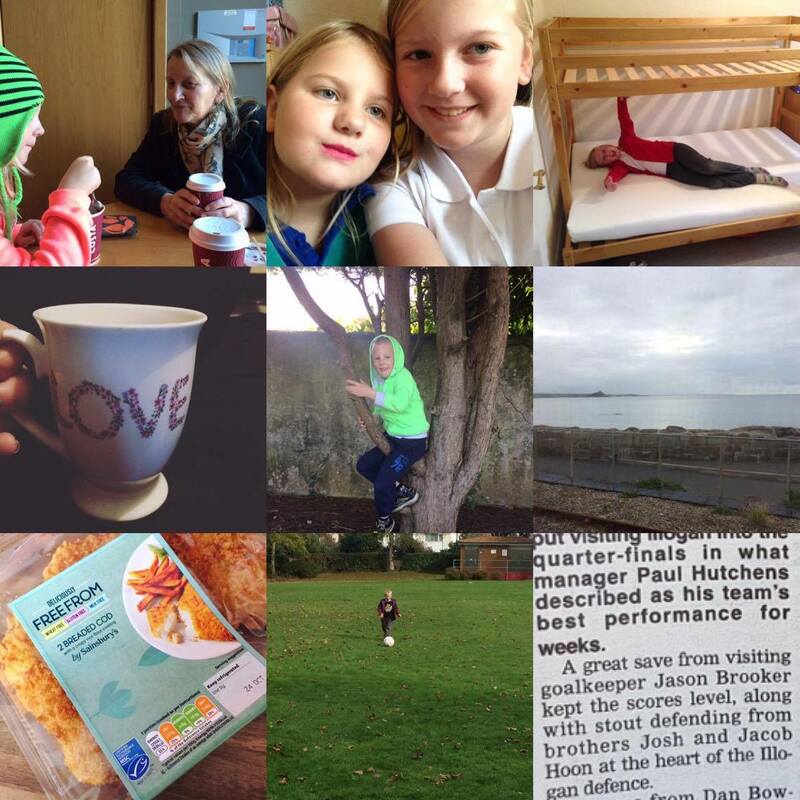 Better late than never, here are my reasons to be cheerful for this week. 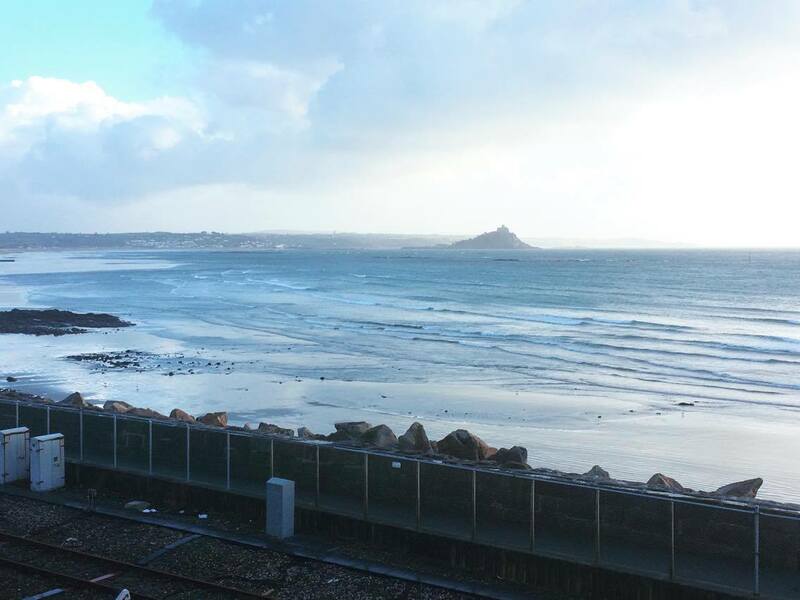 Last weekend Mr B and I had a wonderful break in Plymouth. I won a stay at The Jury Inn back in August I think and booked to stay the weekend after my birthday so I could be with the children and not compromise Mr B's football (reluctantly I might add) We had such a nice evening on Sunday simply spending time together walking around Plymouth. I love these breaks. No matter how short it is it feels so nice to be with each other. We have decided next year the children can come with us because they'd love the hotel. I had a wonderful meeting with a homeless man in Plymouth and in all honesty I haven't forgotten about him since. It all started when he asked if I could buy a Big Issue from him. All I had on me was £2 but he said that was fine, all he wanted was to buy a sandwich anyway. Mr B and I went for our walk and got some chips and we ended up back where we started. As Mr B went into the shop and bought a drink I ended up talking him again. I gave him my chips; they were a huge portion, more than I could manage and we spoke about how he got there, about The Big Issue, where he sleeps, what help he had tried, he was a lovely man. We parted on a smile and a tight hug. I wanted to go back to him in the morning but we got held up when an elderly man collapsed in front of us in the town center. After we sat with him it was time to catch the train home. I felt bad but since then I have decided that my purpose was not to be with the homeless gentleman that day but to be there for the older gentleman who would've had a much nastier fall had we not seen him and been there first. One thing is for sure, I will be buying The Big Issue more often when I have the change and I will continue to remember my encounter. Finally, the children had a lovely Halloween and I had a lovely end to my favourite month. My birthday was great, I had a visit from my friend, our half term was good and didn't cost me a fortune either and we are all settled in the new home. What are your reasons to be cheerful? Link up by clicking the badge below!